Discontinued! This product has been discontinued. This page has been left up for informational purposes. This product has been an endless source of fustration and I have decided to end it. 1) Many people could not understand what it was and how it worked. 2) Support has been a nightmare as I never have access to the actual installation for troubleshooting. 3) Sales have fallen off a cliff so I can't afford to invest more money in making new ones. 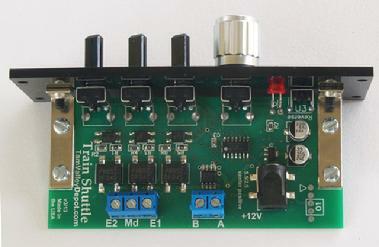 Use the Train Shuttle to automatically run a train back and forth for demos, breaking in locomotives or just for fun. 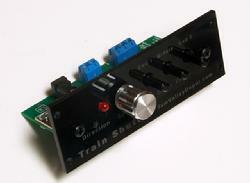 Also makes a really simple way to run a DCC locomotive with its speed, direction controls and basic functions. 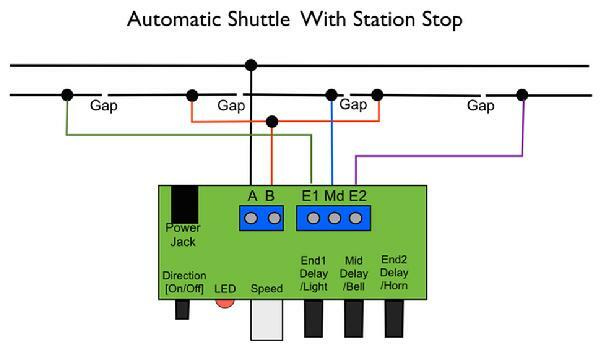 The train shuttle is a DCC command station/throttle with built-in detectors that can automatically reverse direction and simulate a station stop. It works with any locomotive with the address range 1-99. No need to program the locomotive - just take it out of the box and put it on the track. You can also run longer address locomotives by entering them with the optional programmer. This new version lets you activate the lights, bell and horn by twiddling the black knobs. It is not an add-on for other command stations. It must not be connected to another DCC command station. End detection - the Train Shuttle has built in current detectors that use a gap in the rail to isolate a detection section. One rail, the common rail is ungapped. The other rail uses gaps (either cut a gap or use an insulated rail joiner) to make isolated detection sections at both ends. When the train reaches the end it crosses the gap and the Train Shuttle sends it a DCC command to stop and then to reverse direction. 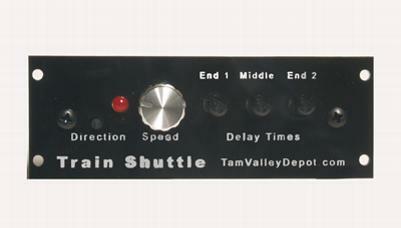 Knobs on the front panel adjust the stop time from 0 to 60 seconds. Station Stop - The Train Shuttle can also simulate a station stop by putting gaps in the middle. When the train crosses in to this section, the Train Shuttle sends the DCC commands to stop, waits for the delay time set by a knob, and then proceeds on in the same direction as before. 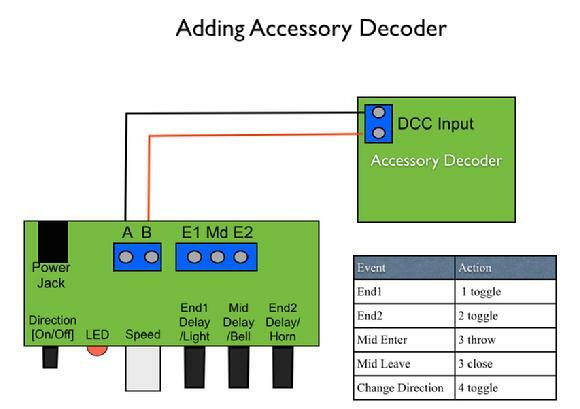 Accessory Commands - the Train Shuttle sends DCC accessory commands (also called stationary decoder commands or switch commands) when the ends are reached. 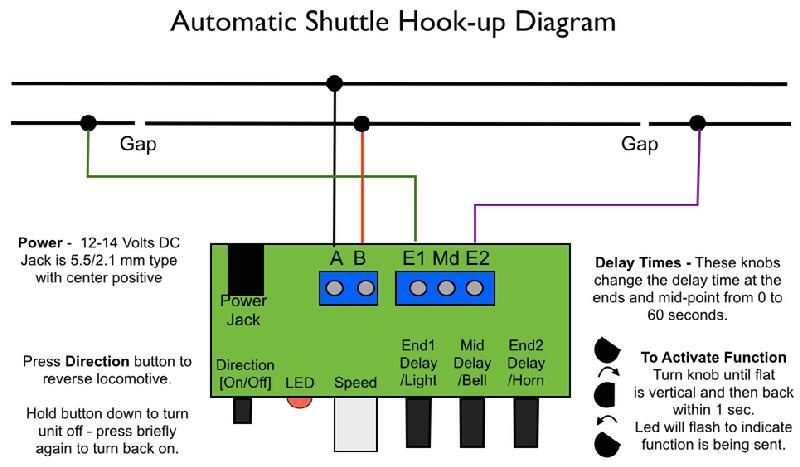 This allows you to throw turnouts so you can have a more complicated pattern. For instance with a single turnout you can make a fork arrangement and have the train alternate which fork it goes down. The manual for the Train shuttle is here. Discontinued - I do have a few left for replacements of broken units. Face Plate Dimension in inches: Width: 4.45, Height: 1.6, Depth: 1.7"
(requires 2.25" to clear power cord). Mounting panel opening: 3.8 inches by 1.25 inches. Note: You must not hook the output of a Train Shuttle to any other DCC source, including another Train Shuttle or damage will result. The Train Shuttle works as it comes with short, 2-digit addresses in the range 1-99 as it comes. It will also work decoders that have a consist address in this range. Almost all locomotives come programmed to the default short address 3 and will work straight away with Train Shuttle. This programming adapter allows the programming of long (or 4-digit addresses) in to the Train Shuttle. In some cases you may find it more expedient to add 4-digit addresses with this adapter than to reprogram the locomotive decoder. The adapter plugs in to a 3-pin plug on the back. You can then use the 4 dials to set a 4-digit address. The address will be saved when the power is turned off. Dimensions: 1.76 inches high, 4.8 inches wide, 0.54 inches deep. 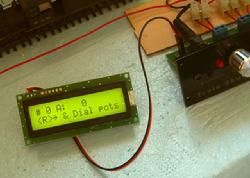 Note: This item is a NewHaven Displays serial LCD module with a 12" servo extension soldered on. You can get these from a number of sources inclusing Digi-Key (part # NHD-0216S3Z-FL-GBW-V3-ND). Unfortuneately, the command set of other brands of serial display differ so you cannot use serial LCDs from Sparkfun and some others.